In the week that Burma's military regime used lethal force to crush pro-democracy protests, filmmaker Evan Williams asks who are the generals issuing the orders, and how do they convince young soldiers to open fire on their own people? One of the biggest challenges in reporting on Burma is trying to understand what the country's rulers really think. "The top echelons are made up of graduates from the defence services academy, which is Burma's equivalent of Sandhurst or West Point," explained Maung Zarni, a former activist. "They receive military science training for four years. For them there is no parent, the army is their parent," he said. The regime is essentially a secretive cabal of 12 generals called the State Peace and Development Council (SPDC). They may disagree behind closed doors but always present a unified position in public. The junta is run by three top generals. Number three is Soe Win, a ruthless military commander who is widely believed to have organised government militia to kill opposition members in the past. He is now believed to be terminally ill in a Singapore hospital. 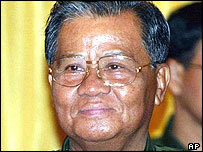 Number two is Maung Aye, a hardliner who is opposed to any talks with Burma's pro-democratic opposition. And at the top is Senior General Than Shwe, a high school drop-out and former postal clerk who rose through the ranks of the army in jungle campaigns and as an expert in psychological warfare. Exile Aung Zaw has spent years trying to get reliable information on the 74-year-old Than Shwe and the way he governs. "[At a] Cabinet meeting he rarely speaks... but he listens very attentively to people... and then he will come out with a decision," he said. Very few foreigners know what is really happening at the upper echelons of Burma's closed, xenophobic and vehemently anti-Western regime. Its fierce nationalism is reinforced by the sense that Burma is threatened by imperialism from abroad and ethnic rebels from within. David Steinberg of Georgetown University, has some insight into the generals' idea of their mission. "I think what's in their mind is that they're the saviours of the country... the country would fall apart without the military in power," he said. The generals' bunker-mentality has been in place since 1962 when they took power from Burma's last democratically-elected government. The top generals have dug themselves deeper into isolation over the past few years, following an internal power struggle between military intelligence and the hard men of the army. In 2003, the head of military intelligence, the regime's number three and prime minister, Lt-Gen Khin Nyunt, was purged and jailed for corruption. "When Khin Nyunt was let go and put under house arrest, that eliminated the senior guy who did know what was going on in the world and was concerned about the world, because he was in charge of foreign affairs," said Mr Steinberg. The generals are not just brutal and insular but increasingly rich. While most people survive on as little as $1 a day, Burma's top leaders control or at least receive a cut from all major business in the country. "People complain of the very substantial bribes that they have to pay, but over and above that... the regime is extraordinarily inept... businesspeople will enter into an agreement with various forces in Burma only to find that decision reversed sometime later," according to Sean Turnell, who edits the Burma Economic Review'. The profits from Burma's vast natural resources finance a lavish lifestyle for the generals at the top. Last year, ordinary Burmese were outraged by a video posted on the internet showing the wedding of Than Shwe's daughter. She was seen dripping with diamonds and accepting gifts said to be worth up to $51m. Despite the dodgy deals there are many eager to do business with the regime. "China wants strategic minerals, oil and gas, raw materials," said journalist Isabel Hilton. "That, of course, upsets India, so what you've seen in the last several years is India trying to counter that influence... and the junta playing them off against each other with relative skill." China has for years provided international diplomatic cover for Burma's regime. It has repeatedly vetoed attempts to have Burma even discussed in the United Nations Security Council. But the beating and shooting of monks and protesters on the streets of Rangoon may now change that, especially as China is seeking the international respectability it so desperately craves from next year's Beijing Olympics. "I think we're at a bit of a watershed," said Ms Hilton. "This week you've seen the Chinese not blocking the UN taking the issue up - they haven't been particularly forward but they haven't blocked it. And I think after this crisis you're going to see China going to the Burmese regime and saying 'You have to sort this out'". But not everyone believes Burma's intransigent generals are prepared to listen. "I think Burma's military regime are very unresponsive to quiet words, even by their closest trading partners," said Mr Turnell. "This is a regime that very often doesn't understand its own interests, or the country's own interests, and so they do tend to be quite tone-deaf to any talk of economic reform or political reform." Given the military's stubborn desire to cling to power at any cost, many believe more bloodshed is inevitable. But there may be those within the country looking at a different option. There have been rumours of a potential mutiny among some commanders - the regime's worst nightmare. "I think there are a lot of army officers who really want to see change, who have been abroad and... want to be proud of the country," said Aung Zaw. "But the thing is that the state power has been hijacked by the handful of the military leaders... I think they're afraid. That's why they responded with brute force... They rule the country with fear but they also live in fear."